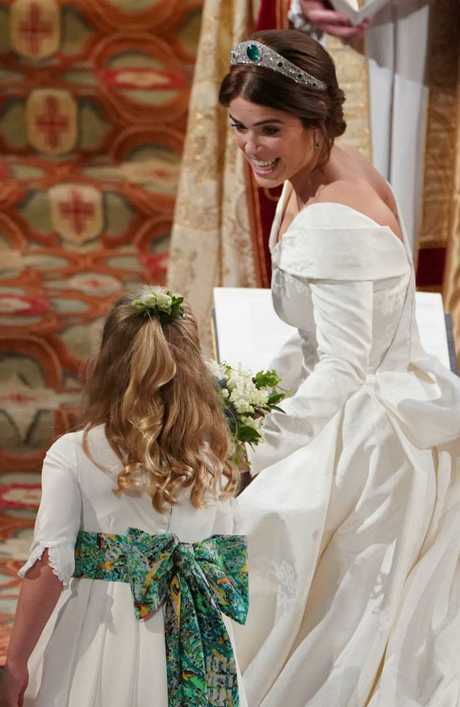 BARING her shoulders in a heavily sculptured gown with a deep-V backline, Princess Eugenie used her walk down the aisle as a moment to show off her childhood battle with scoliosis and her patronage motto: "it's okay to show your scars". 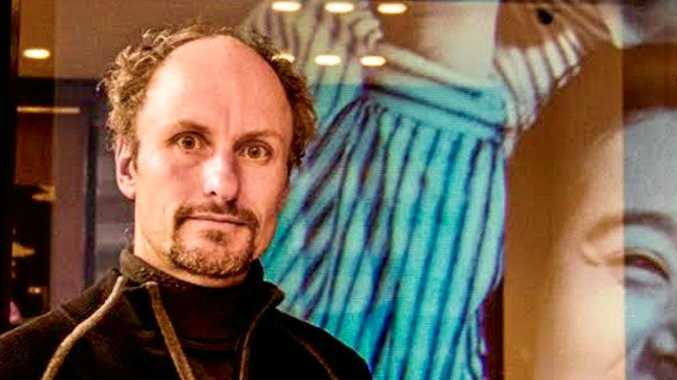 Peter Pilotto and Christopher De Vos were asked to craft the bridal gown of couture gown, of silk jacquard, to make a feature of her scoliosis scars, after she was operated on at the age of 12 and now lives with two steel rods supporting her spine. 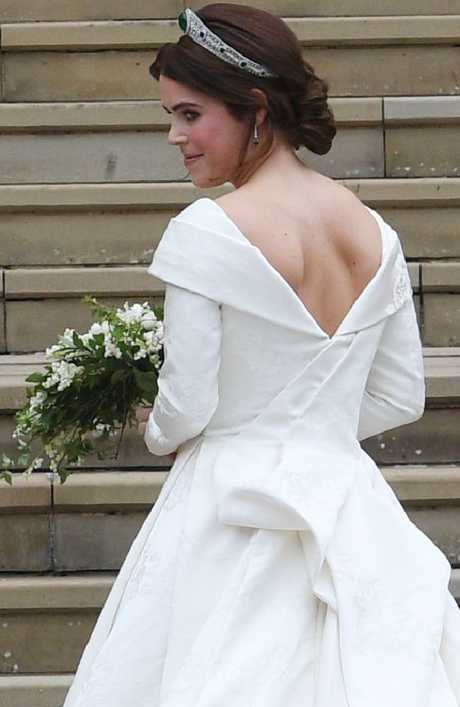 The A-line silhouette was kept simple in the front, but featured modern pleating and a sweeping train, which billowed out behind her as she walked the long aisle of St George's Chapel, inside Windsor Castle. Eugenie hinted she would show off her scars, during an interview with British breakfast TV this week, and also invited guests from the Royal National Orthopaedic Hospital, where she had been operated on. 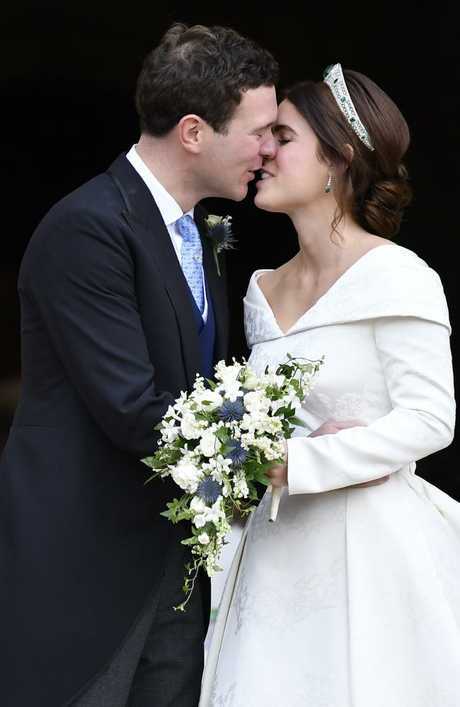 Going without a veil, instead the bride's designers wove meaningful motifs into the gown's fabric made in Como, Italy: shamrocks for her mother's family heritage; the York rose and ivy, which grows outside the couple's Kensington Palace cottage. The emotional groom, in traditional mourning suit, sported tortoise-shell glasses before the ceremony, taking them off to wipe away a few tears and during the ceremony. 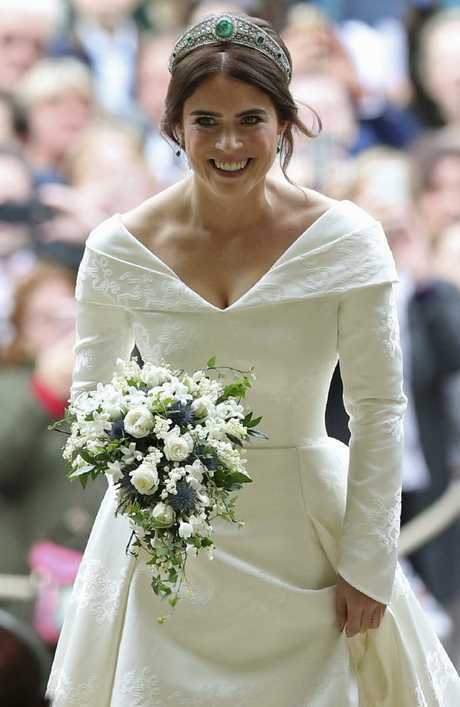 While he cried and appeared at times to look like he may faint, the beaming bride giggled and flashed the same smile her mother, Sarah wore when she wed Prince Andrew in 1986. 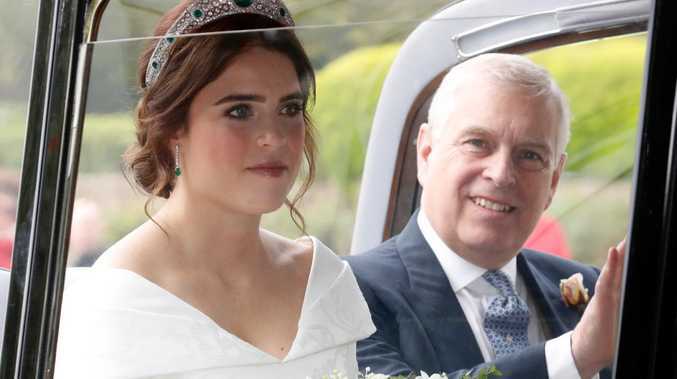 Now the Duke of York, the grey-haired father of the bride was under strict orders not to rush his daughter down the aisle; mindful of the sizeable layers of her gown and Eugenie's fear she would trip - as she did, up the stairs to the chapel. 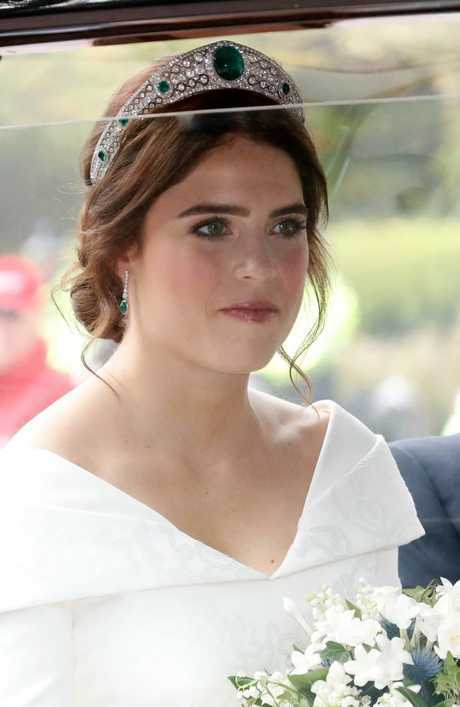 Adding sparkle to the autumn day, the bride's tiara was her 'borrowed' - with the Queen loaning her granddaughter the Greville Emerald Kokoshnik Tiara - made up of brilliant and rose cut diamonds pavé set in platinum, with six emeralds on either side. The tiara was originally made by jewellers Boucheron, for socialite Mrs Ronald Greville, who bequeathed it to Queen Elizabeth in 1942. The bride's diamond and emerald drop earrings, were her 'new' - gifts from her new husband - who stared lovingly at his bride as they sat holding hands together during performances by opera star, Andrea Bocelli. The wedding bouquet featured Lily of the Valley, Stephanotis pips, hints of baby blue thistles, white spray roses and trailing ivy. Sprigs of myrtle from Osbourne House, a family retreat of Queen Victoria, added a sentimental touch - first carried by Queen Victoria's eldest daughter, Princess Victoria, when she married in 1858.